What it's about: This is the inspiring true story of William Kamkwamba, a boy with big dreams who built a windmill from junkyard scraps in order to help feed his village. William always dreamt of magic -- the magic of Ghost Dancers and witch planes, but also of the magic that made radios play music and trucks rumble by the fields his family farmed. When famine hits their village, William is forced to drop out of school and eat only one meal a day. Undeterred, he studies science books from the library and learns how to unlock the magic of a windmill, a magic so strong that it will help him feed his people. Why read it: Readers are introduced to the culture of Malawi and see what it is like to live in a country very different than their own. The main character is a boy full of curiosity and can-do spirit who persevered even when people said he was crazy. Children see that hard work pays off and learn the importance in believing in their dreams. The illustrations are worthy of this empowering and hopeful tale, rich and warm and accented with cut-paper collage details. It's an inspiring story of courage in the face of hardship, and ingenuity with limited resources. For a truly inspirational book, check out The Boy Who Harnessed the Windby inventor William Kamkwamba and journalist Bryan Mealer with pictures by Elizabeth Zunon. Forced to drop out of school when famine struck Malawi, fourteen-year-old William turned to the local library where the pictures of windmills inspired him to build his own. Hoping to provide a steady source of water for his family’s farm, he gathered materials wherever he could find them. Using a bicycle wheel, plastic pipe and other odds and ends that children will recognize, William succeeded in building a working windmill and providing energy for four lightbulbs and two radios. The determination and ingenuity required for his success are astounding yet make it clear that we are all capable of so much more than we might have imagined. Born in Albany and raised in the Ivory Coast in West Africa, painter and collagist Elizabeth Zunon has lived in the Capital Region since she was 12 and brings a multicultural sensibility to her work today as a children’s book illustrator. She’s 27 and just a few years out of design school, but two books that she illustrated have already been published. Another will be out in January, and she is at work on a fourth. Her first book, “My Hands Sing the Blues,” written by Jeanne Walker Harvey, is a biography focusing on the childhood of twentieth-century African-American artist Romare Bearden. Published just this month, her second is titled “Lala Salama: A Tanzanian Lullaby,” written by Patricia MacLachlan, the Newbery Award-winning author of “Sarah, Plain and Tall.” The third will be “The Boy Who Harnessed the Wind,” a picture-book version of the New York Times nonfiction bestseller by the same title. Zunon and MacLachlan will sign copies of their book together on Saturday at the Open Door Bookstore in Schenectady. Throughout her apartment, paintings in rich corals that looked as if they might be paintings of wind were laid out to dry. When asked if they were for “The Boy Who Harnessed the Wind,” she explained that no, they were for “A President from Hawaii,” which she needs to complete by Thanksgiving (“it’s a bit of a rush project”). Photos of tropical leaves and plants were tacked up on bulletin boards as reference. Zunon said that she was inspired, while working on that fourth book, by the plant shapes she used in silkscreening fabrics for her handbags and pouches (“Everything is all connected in my work”). Her parents met when both were students at the University at Albany. Her mother was born and raised in Albany, and her father was from the Ivory Coast. The family moved to West Africa when Zunon was just two months old, but maintained a deep connection to Albany, spending six weeks or so every year here with Zunon’s maternal grandparents. As a child she loved stopping with her family at the marketplace every Sunday, where she would admire the patterned fabrics and the traditional crafts of West African artisans (“I always spent my whole allowance on beads”). The family returned to the Capital Region when Zunon was 12, and she attended Guilderland schools beginning in eighth grade. It was at high school that, she says, “I started being a lot more invested in my art classes and the art teachers were really pushing me to perhaps focus on furthering my education in the arts.” Zunon attended the Rhode Island School of Design, majoring in illustration (“I took a lot of drawing and painting classes”) and graduating in 2006. She then moved to the New York City area and began looking for jobs at museums and galleries, but “you can’t really get a full-time job anywhere painting portraits and still-lifes.” When she eventually found work, it was at a flower shop, as “the girl who hand-wrote all the notes to people and wrapped up all the flower arrangements.” She worked there for almost a year, till two days before Christmas 2008, when changes in the economy forced the shop to downsize (“I was on the train coming back to Albany and I got a phone call, ‘We won’t be asking you to come back’”). But since graduating she had also gone to many conferences and portfolio reviews — one-on-one critiques of an artist’s work by art directors, agents, and other professionals in the publishing industry — and at one of these had met Lori Nowicki, who would later become her agent. Farmers in Malawi, as in so many African countries, are desperate for water. Often, people hike for several hours to a common well, where they fill pots and bring them back home to dole out carefully, plant by plant. When a drought ravaged William Kamkwamba's family farm, his father reduced their meals to one a day and told William, then 14, that he could no longer afford to send him to school. William, unhappy about this, remembered pictures of a windmill in a library that Americans established near his village. He scavenged trash — a broken bicycle, a tractor fan, a shock absorber — and created a wobbly but working windmill. His prototype eventually led to a windmill and solar pumps that irrigated his mother's garden and his father's fields. This picture book simplifies the best-selling nonfiction book that the same authors published three years ago. Ages 6 and up. 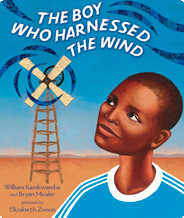 Kamkwamba, William The Boy Who Harnessed the Wind; by William Kamkwamba and Bryan Mealer; illus. by Elizabeth Zunon. At age fourteen, William is forced to drop out of school; the drought in Malawi has wreaked havoc on his family’s crops and there is no money for tuition. He starts spending time at the American library, where he learns about windmills and their power to “produce electricity and pump water.” Determined (and, according to his neighbors, slightly “misala,” or crazy), he hits the junkyard and constructs a windmill that produces enough energy to light a small bulb. This is only the beginning for William, who later went on to create a solar-powered water pump in his family’s field and is currently an engineering student at Dartmouth with plans to return to Malawi “to work on renewable energy for electricity and pumping water in villages.” This young reader’s edition of Kamkwamba and Mealer’s bestselling adult title is perfectly whittled down for the picture-book set, and the story of William’s creativity and perseverance is well suited for young dreamers. The language is rich and evocative, from descriptions of the ravages of hunger (“alone with the monster in his belly and the lump in his throat”) to his imaginings of how a windmill could impact his village. Zunon’s compositions seamlessly combine oil paintings with touches of cut-paper collage work, and rich, unexpected colors and textures bring warmth and intensity to the scenes. Wow! 1292 children read 10,009 books in two weeks on Pearson Foundation's We Give Books website, resulting in over 10,000 children's books to William Kamkwamba's Wimbe village library and additional schools/libraries in the area via William's NGO Moving Windmills. Thanks to Dave Schenone at We Read Books and Lauri Hornik at Dial Books for children. Thank you to our top 3 readers: pvpvrawlings, Harbins, and shaktimama. Maria Popova, founder and editor of Brainpickings' review of "The Boy Who..."
What bamboo poles and bicycle chains have to do with sparking the spirit of entrepreneurship. 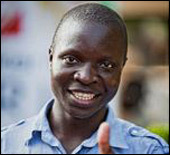 When he was only 14 years old, William Kamkwamba dreamt up a windmill that would produce electricity for his village in Malawi. The trouble? As Malawi was experiencing the worst famine in 50 years, William had to drop out of school because his family could no longer afford the $80 annual tuition. This meant he not only had no money to purchase the parts, but also no formal education to teach him how to put them together. Determined, he headed to the local library and voraciously devoured its limited selection of textbooks, then gathered some scrap parts — a bicycle dynamo, bamboo poles, a tractor fan, rubber belts, a bike chain ring — and brought his vision to life, building a functioning windmill. He spent the next five years perfecting the design and went on to found the Moving Windmills Project in 2008 to foster rural economic development and education projects in Malawi. In 2009, Kamkwamba shared his moving story of perseverance, curiosity, and ingenuity in the memoir The Boy Who Harnessed the Wind: Creating Currents of Electricity and Hope. Now, this modern-day entrepreneurial fairy tale is being adapted for young hearts and minds in the beautifully illustrated children’s book The Boy Who Harnessed the Wind: Young Readers Edition. Kamkwamba’s story shines with all the more optimism and tenacity in the hands of 27-year-old artist Elizabeth Zunon, whose rich, lyrical, almost three-dimensional oil-and-cut-paper illustrations, reminiscent of Sophie Blackall’s, vibrate with exceptional whimsy and buoyancy. Coupled with the launch is a wonderful literacy effort — for every book parents, teacher, and children read online on We Give Books, the Wimbe community lending library, where Kamkwamba’s journey began, gets a new book, up to 10,000. Despite serving some 1,500 pupils, the library currently has no picture books. Beautiful, moving, and immensely inspirational, The Boy Who Harnessed the Wind: Young Readers Edition tells the kind of story that helps budding entrepreneurs relate to the world through a lens of infinite possibility — the kind of message that might, just might, empower them to harness if not the wind the future itself. Last chance for you and your kids to take part in our literacy drive around my new children's book The Boy Who Harnessed the Wind, written with my friend Bryan Mealer and illustrated by Elizabeth Zunon. Thank you to all the American children who have made it possible to change the lives of the primary students at the school I attended in my hometown of Wimbe, Malawi. These will be the first picture books they've every had.